Prime Minister Theresa May has hinted the UK is heading for a ‘hard Brexit,’ as the country will not seek to “keep bits” of EU membership. The PM’s response to a question on whether Britain will prioritize immigration controls over access to the single market caused the pound to drop on Monday, falling to its lowest level since late October. Leading Brexit campaigner and former Education Secretary Michael Gove has urged the PM to back a ‘full Brexit’ by leaving the single market and customs union, as opposed to a ‘fake Brexit’ which would see Britain retaining some elements of membership. May denied the government is confused over its EU exit plans, and said she would reveal more of her negotiating aims in the next two weeks. 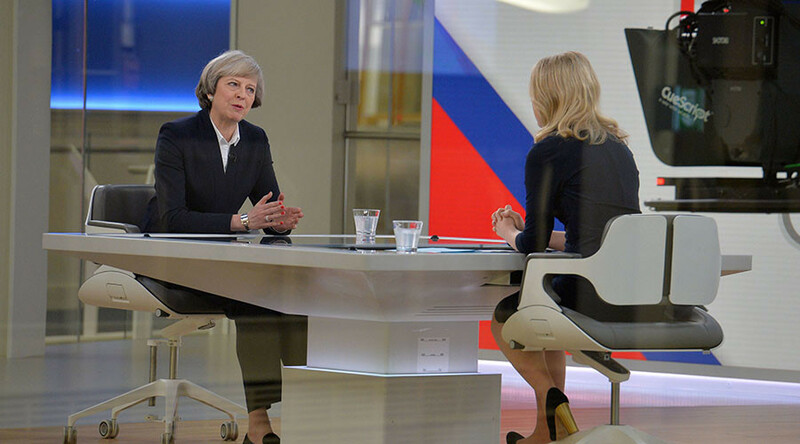 “Often people talk in terms as if somehow we are leaving the EU, but we still want to kind of keep bits of membership of the EU,” she said on the Sophy Ridge on Sunday show. “Our thinking on this isn’t muddled at all,” she said in response to Rogers’ criticism. Businessman Sir Andrew Cook, a major Tory donor, has warned he will no longer give money to the party if it backs leaving the single market. Writing for the BrexitCentral website, ex-minister Gove said: “We need to deliver a full Brexit, not settle for fake Brexit. Once Article 50 is triggered, we should be very clear about our simple, straightforward, generous approach to leaving. “We don’t want or need to be in the single market – outside we can control our own borders, laws and taxes. Inside we’re trapped. We don’t want to be bound by being members of the customs union. Outside we can negotiate new trade deals with emerging economies.